Glowing green juice recipes. Be a green goddess (or god) with these tasty combos. Green juice recipes contain a great deal of chlorophyll and provide live giving nutrients to our body. Chlorophyll gives energy and life to our cells. A green drink helps to purify our blood, especially excellent for normalizing blood sugar levels. They are the single most important juices and foods to get into our diet. Their cleansing, healing and vitamin properties are sub-par to any other! Notes about green juice: Greens are best combined in other juices for beginners. They can be strong and detoxify your body at a rapid rate for some people, causing ill effects. If you feel nauseous after drinking green drinks, just have less and work your way up to more. Here are some more details on juicing green juice and the benefits of leafy greens. 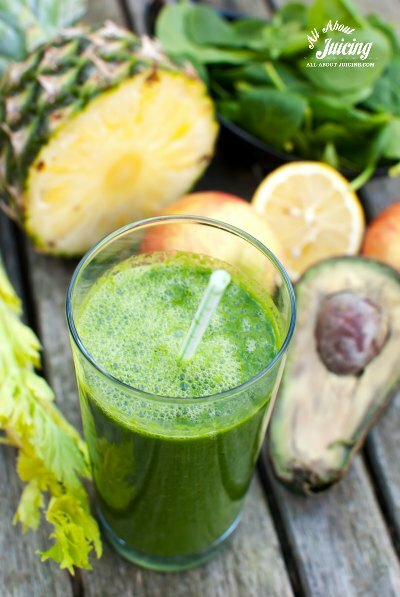 Want to know more about how green juice recipes are good for you? Here are the benefits of chlorophyll. It will make you a believer! Core the apple, and juice 1/2 the apple, carrot, celery, cucumber and spinach. Serve immediately. Core the apple and split in half (you could use a whole one, if you'd like). Juice the carrots, apple, celery and parsley. Drink immediately. This is a great energizer. Parsley (even just a little) in anything gives you a kick! Clean the lettuce and cut so it's manageable to juice. Cut the lemon in half. Juice hte lettuce (or celery), apples, kale, and lemon. Serve immediately. The apples and pears are added to make it more palatable. Cut a cucumber in half. Cut the honeydew, and remove the rind as it's not good for juicers. Juice the cucumber, honeydew, grapes, kiwi, spinach, lemon and mint. Drink immediately. Remove carrots tops, if necessary. Juice the carrots with the kale and serve. Juice the carrots, spinach and cabbage together as usual. Serve. Cut the cucumber into spears. Cut a lemon in half and core the apples. Juice the cucumber, kale, celery, lemon, ginger and apples. Serve immediately. This will make about 2 glasses of mean green juice. I believe this recipe is what Joe Cross used in his movie and called "mean green juice." Do you have a green juice recipe? Do you have a great or different green juice recipe to share? Share it here so others can make your juice! Do you have some pictures of our juice to add? Great! Click the button and find the first one on your computer. Select it and click on the button to choose it. Then click on the link if you want to upload more images.